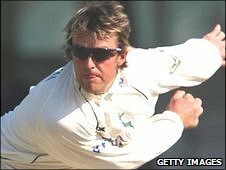 England spinner Graeme Swann has signed a new two-year deal at Nottinghamshire, which keeps him at the club until 2012. Swann, 31, joined from Northants in 2005 and since then he has established himself in the international team. And although England's current player of the year is likely to stay centrally contracted next season, Notts director of cricket Mick Newell was delighted. "He is a player every county would want and he'll make positive contributions whenever he's available," Newell said. Swann has become a key component of the international set-up, taking 97 wickets in 22 Tests, and was a major contributor to England's success in the 2009 Ashes series and the ICC World Twenty20. Newell added: "Six years ago I felt that Graeme was the best one-day bowler in the country but he wasn't fulfilling his potential. "It was clear that he always had the talent and now he's applied it and surpassed my expectations with his achievements over the past two years. "Our dressing room is a better place for having him around and I'm pleased that he sees his future at Trent Bridge." Swann took two wickets in his only County Championship appearance against Warwickshire this season and played for Notts in Saturday's Friends Provident t20 semi-final against Somerset.